It feels like Wizards of the Coast has been relying a little too much on their demon lords as the Big Bads in their adventures and campaigns the last few years. Demon fatigue—it’s a thing! But if you’re going to stick with the demon theme, then what the hell—use all of the demons. 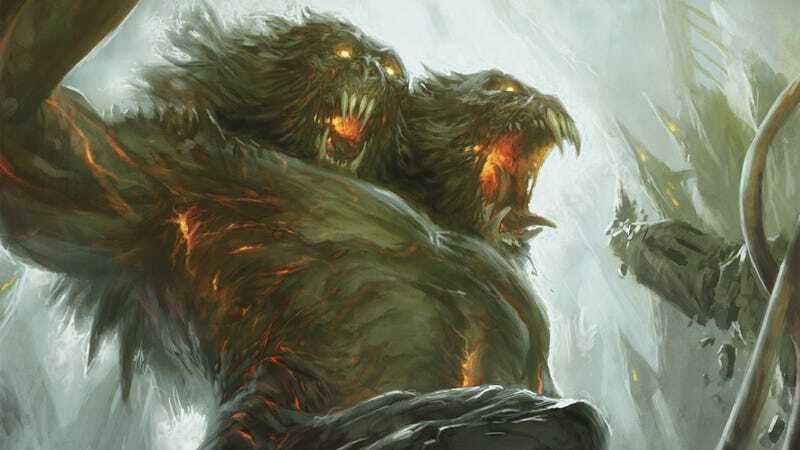 And that’s exactly what WotC is doing for D&D’s upcoming Rage of Demons storyline, which is like a infernal All-Star Game, as Demogorgon, Orcus, Lolth, Juiblex, Zuggtmoy, Grazz’t and more invade the Underdark realm of the Drow. Rage of Demons’ storyline takes place across video games, in-store role-playing games, and novels, and since it takes place in the Forgotten Realms, it involves everyone’s favorite good-guy dark elf, Drizzt. They made an animated trailer for it, which is actually pretty cool. For us tabletop players, the core of the Rage of Demons experience will be the new hardcover adventure, Out of the Abyss (feel free to make your own Straight Outta Thanatos memes in the comments). There are some cool things you should know about Out of the Abyss. Wizards is continuing the practice of working with third party companies to produce their D&D adventures. This time around they’ve teamed up with Green Ronin, the company that makes The Song of Ice and Fire RPG, which is possibly my favorite RPG of all time. The design and editing team is packed with game designers whose work I have greatly enjoyed in the past, including Steve Kenson, Cam Banks, Robert J. Schwalb, Chris Pramas, Rodney Thompson, Christopher Perkins, and quite a few others. Off the top of my head I can think of half a dozen great games designed by the people on that list. The other interesting thing about Out of the Abyss is that the designers have shaken up the champagne bottle a bit. In other interviews I’ve seen it described as turning the Underdark (the vast subterranean realm that lies beneath the Forgotten Realms) into an Alice in Wonderland sort of place, and that seems to be a very apt description. Despite the focus on demon lords, Out of the Abyss is infused with whimsy. There are outlandish characters, fantastic landmarks, and a creeping madness, but the overall feel is more Labyrinth than Lovecraft. Not that it’s a silly adventure (you start off enslaved by drow), but there are dwarves who crave pancakes. To help create that atmosphere of wonder and amazement, the cultures that live in the Underdark were given much more detail and attention. The drow are the most familiar, and even they’ve been redesigned to some extent. The eternally creepy illithid have become much, much creepier, since the demon lord Orcus has made them crave undeath. Liches are bad. Illithid, also bad. Illithiliches? Super bad. In the concept art above and below, you’ll see details on Underdark architecture and even each race’s clothing styles. I talked with Chris Perkins (whom you may also know as the Dungeon Master for the live D&D shows at PAX) about the design process, pancakes, and spider skin cloaks (for the record, I think he’s lying about Snuffleupagus. You’ll see). io9: I’d like to focus on the mind-flayer, which have always seemed like one of D&D’s truly original monsters. There’s not much precedent for them in classic fantasy fiction, although they are certainly a bit Lovecraftian. Where do you see illithid in the D&D monster hierarchy? What influences do you think inspired their earlier iterations? Chris Perkins: Gary Gygax, co-creator of Dungeons & Dragons, cited H.P. Lovecraft as one of his biggest influences. My guess is that the mind flayers we’ve come to know and love are Lovecraft-inspired creations. However, the monster didn’t become a true icon of the game until the release of The Illithiad, which shed a lot of light on the mysterious race. They’re evil masterminds who feed on humanoid brains, and that’s pretty terrifying, and they like to enslave other creatures. They embody a lot of things that terrify the human imagination, and I think that’s why they’ve become as iconic to D&D as dragons, beholders, and drow. To really flesh out the illithid as villains, it appears you’ve explored their culture and their alien way of thinking in a much deeper way than ever done before. What’s new about mind-flayers these days? How does their new cultural focus on undeath change their ways of interacting with other races? Perkins: One of the best things that came out of our Rage of Demons story meetings was the notion of Orcus, the Demon Prince of Undeath, “saving” a mind flayer enclave whose elder brain, Cyrog, has died. Orcus reanimates the dead elder brain and uses it to telepathically compel the mind flayers to embrace undeath, because the only thing scarier than a mob of mind flayers is a mob of undead mind flayers. That’s what Orcus does: he annihilates life and replaces it with the living dead. What does this mean for Cyrog, its mind flayer thralls, and their neighbors? That’s the big question. We had a couple concept artists create some interesting mind flayer imagery. I particularly liked the concepts for the illithid brain urns—vessels the mind flayers use to store and leech juices from harvested humanoid brains. I love the focus here on learning about a race of creatures through their architecture. No more monsters living in plain 30’ x 30’ rooms connected by 10-foot corridors! What are some resources you’d recommend to players and DMs who want to explore and incorporate the idea of different types of architecture into their campaigns? Perkins: Type the phrase “weird fantasy architecture” into any internet search engine, and you’ll discover all sorts of crazy architectural ideas. The hard part is finding the perfect architectural theme for the architect of your dungeon. A dungeon is an extension of its creator’s personality. If I’m creating a dungeon that was built by dwarves, there might be faucets in the walls that dispense beer, a fountain crafted to look like a frothing ale mug, or trapezoidal alcoves displaying the anvils of long-lost dwarven clans. If your “dungeon” is a wizard’s tower or mansion, it might have a lightning bolt-shaped weather vane, windows that appear only when the proper command words are spoken, and magical portraits of the wizard that can actually cast spells at intruders. It’s great to see the lesser known deep races, the derro and svirfneblin, get some attention. Can you tell me a little more about the Circle of Savants? And what’s up with the Gray Ghosts’ thing with pancakes? Perkins: Derro and deep gnomes (svirfneblin) get a lot of attention in Out of the Abyss. The derro are particular fun because they are deeply flawed creatures. First, they’re insane. Second, they’ve invented an entire history of their race that’s completely bogus. Their story is compelling because it’s so tragic and pathetic. The derro, in fact, were once dwarves that the mind flayers enslaved and corrupted. They’re basically mad, degenerate dwarves. However, rather than face this reality, they’ve invented all sorts of crazy myths about their origins, their gods, and their destiny. What is the current state of the drow matriarchy? Drow culture endures sweeping changes from time to time, but the women always come out on top. Perkins: The drow matriarchy is put to the test in Rage of Demons. The story begins with a single disenfranchised male drow casting a spell that harnesses the power of the faerzress (the ambient magical radiation of the Underdark) and opens the floodgates to the Abyss. This drow is Gromph Baenre, the Archmage of Menzoberranzan, arguably the most powerful male drow spellcaster in the Forgotten Realms, yet he feels subjugated and betrayed by Lolth and her priestesses. His sister, Quenthel Baenre, pushes him a bit too far. However, she’s no pushover herself. In fact, she views the demonic invasion as an opportunity to purge the Underdark of its dregs, within drow society and without. Consequently, she doesn’t fret when Demogorgon rampages through Menzoberranzan. As far as she’s concerned, everything that happens is part of Lolth’s grand scheme, and in this case, she’s right. The drow are iconic D&D villains, and their matriarchal society is part of their core identity. We’re not looking to fundamentally change that, so don’t expect drow males to supplant their female superiors any time soon. What does wearing a cloak made from giant spider hide feel like? Perkins: It’s like being hugged by Mister Snuffleupagus.